I have always had thick, curly hair. Growing up in New York City in the 90s when stick straight hair was en vogue, I always felt like the odd woman out. Make no mistake, when dealing with thick, curly hair, curating the right product selection is a process and finding a hair care expert that is intimately familiar with cutting curls and how they behave is an imperative. Just as important is finding the right products which can be akin to a science experiment. You have to be patient and willing to try different combinations of products to see how they interact with each other and your hair. I have experimented with many different products in so many categories. Today, on the precipice of 41, I have learned to appreciate my curly situation. Every day is a little different and even if you have the best products – you’ll always have a day where a little frizz infiltrates the system…until now. Enter Christophe Robin, colorist of choice to the world’s most celebrated actresses and top models including Natalie Portman, Catherine Deneuve, Tilda Swinton, Kylie Minogue, Kristin Scott Thomas – you get the picture. While working with his clientele to transform their hair color for fashion shows and on the sets of film and television, he began to understand what hair needed to look and feel healthy and beautiful. Robin launched his own hair care line, designed to nourish, strengthen and protect color-treated and sensitive hair and scalps from root to tip. All Christophe Robin products are formulated with powerful, rare ingredients and inspired by traditional recipes to address the needs of men and women with all hair types, textures and conditions. In addition to restoring hair health, these innovative products are free of parabens, silicone, harsh sulfates, oxidants and ammonia. Best of all, they make hair look outstanding! They are the best I have come across. Until recently, I had to travel to France or St. Barths to purchase these hair care gems. Lucky for all of us, it can now be found in The US. I can’t say enough good things about these products. It keeps my hair in line, even on the most humid of days. I have also seen it work wonders on friends with fine or even thinning hair. The Volumizing line is bar none, the best I have seen. I sat down with Christophe to interview the man behind the line. AW: How did you choose your current career path? CR: Growing up in the French countryside, I remember spending weekends with my mother and her friends while they coiffed their hair. I started coloring hair when I was 14 years old as an apprentice. The lady who trained me told me that you can’t have a beautiful result if you don’t take good care of the hair. I was passionate about hair color and the craftsmanship that it involved. At the age of 17 I arrived in Paris to work on my first big shoot! Things started to snowball. Everything happened very quickly! AW: What is your philosophy? CR: Beautiful hair color cannot exist without good care! A healthy and balanced scalp leads to healthy and beautiful hair! AW: What do you love most about what you do? CR: I have always been passionate about enhancing a woman’s natural beauty through hair color. It’s usually very subtle changes, but I love how it can unveil her eye color and enhance her complexion. I feel incredibly lucky to be able to do what I love and meet people along the way! AW: What is the most important piece of hair care advice you give? CR: Take great care of your hair! It’s the little things that count, brushing your hair before washing it with a gentle hairbrush, protecting your hair with a plant oil before washing it and, once a week, doing a deeply nourishing treatment for your hair (think Cleansing Mask with Lemon or Regenerating Mask with Rare Prickly Pear Seed Oil). AW: What is your process for creating the very best in hair and scalp care? CR: I listen to what people have to say! In my salon, on movie sets or photo shoots, I always listen to what people have to say, it’s incredibly valuable. My Cleansing Purifying Scrub with Sea Salt was created for women who experience itchy scalp due to color residue buildup. It’s quite common, and sea salt is known to soothe the irritation! The same is true for for my Cleansing Mask with Lemon and Moisturizing Hair Oil with Lavender. These were the first products I created. I used to work with models changing their color 4 to 5 times a week. Imagine the damage! I needed something to protect their hair and wash it gently. AW: Has there been a single defining moment in your career? CR: The day Catherine Deneuve called me in my salon to make her first appointment! Pro tip for curly, dry or color damaged hair: Once a week apply, on dry hair, Hair Oil with Lavender through lengths and then apply Cleansing Mask with Lemon right over it. Leave it in for as long as possible. I leave it in all day or sleep with it in my hair overnight. An hour will do the trick as well but the longer the better. Results are astonishing! For more on this moisturizing treatment, see the how-to video below. Is there anyone in your life more deserving of a little love and luxury than mom? Often, though, mom is so busy managing the family like a well-oiled machine that she has no clue what she wants or may be in need of. Even if you press her for ideas, you’re given an “oh, I don’t know” and are thus left to guess for yourself what she would actually use. Enter our collection of luxury kits and revolutionary beauty products from some of the world’s best beauty brands. You will find the perfect something for even the most difficult to shop for moms out there. Sapelo Skin Care Spring Tide Serum: In addition to high concentrations of a potent cocktail of proteins, peptides, amino acids, active Omega 3 fatty acids, vitamins A and E, as well as selenium, magnesium, copper and zinc, the fourth ingredient is 5% highly blenderized unfertilized, organic Norwegian Salmon Roe Extract. This extract stimulates growth in the dermis boosting the skin’s ability to build collagen, elastin and hyaluronic acid. 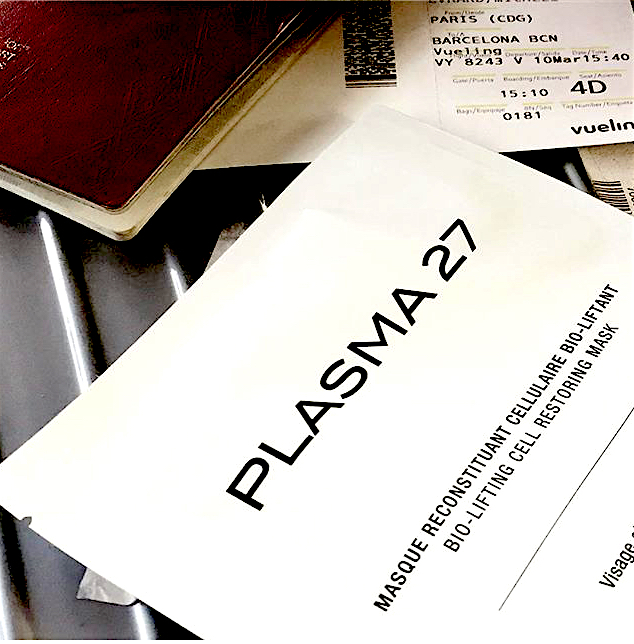 Cosmetics 27 Plasma 27 Bio-Lifting Cell Restoring Mask: It nourishes and hydrates the skin, calming inflammation and stimulating it to produce increased collagen and elastin on its own. It is a 15 minute facial in a pouch. All the work is already done for mom – it’s presoaked with just the right concentration of ingredients and pre cut, so all she has to do is open the pouch and put it on. We’ve curated a collection of our favorite anti-aging superstars from Deborah Mitchell’s Heaven Skincare line. The Long Weekender Kit is a comprehensive starter kit just for you. It covers all the skin care bases: there’s a cleanser, an exfoliator, a 2-in-1 toner/serum, a daily anti-aging moisturizer and, of course, the world famous Silver Bee Venom Mask (which is a great gift in and of itself) If mom feels she’s too busy to shop for skin care, you’ve just done all the legwork for her. It has been said that if your hair looks great you’re 90% there. If hair is your mom’s mane event, we’ve got some kits she will dye for. French native, Christophe Robin is the colorist of choice of the world’s most celebrated actresses and top models including Natalie Portman, Catherine Deneuve, Tilda Swinton, Kylie Minogue and Kristin Scott Thomas. His revolutionary, award winning line of natural hair care products will bring the absolute best out of mom’s hair. Christophe uses powerful, rare ingredients inspired by traditional recipes to address the needs of all hair types, textures and conditions. Two of our favorite collections are Restoring Hair Ritual, formulated with rare prickly pare oil to nourish and restore color-treated, dry, damaged, thick curly and/or course hair. And Detox Hair Ritual, a universal collection of exceptional travel companions formulated for those with dry, sensitive or oily scalps. With Lavido’s Inspired by Nature Head to Toe Collection, a luxurious anthology of plant-based skin and body care infused with the ancient healing powers of the Sea of Galilee. Our favorite products in this gift box are: Alert Eye Cream, Gentle Exfoliator Peeling Cream and Thera Intense Body Cream. Lavido is a natural skin and body care line made with the best raw, plant-based ingredients and purified waters from the Sea of Galilee. This is Israel’s best kept skincare secret. In case you haven’t noticed, we have been raving about Philip Kingsley’s Elasticizer for years. It has won numerous awards, and is a go-to hair hero for celebrities, stylists, beauty editors and The Travel Beauty Team. Elasticizer was developed by Philip Kingsley in the 70s for legendary actress Audrey Hepburn. Audrey sought Philip’s help after years of on-set over-processing had left her hair majorly damaged. Audrey’s condition prompted Philip to formulate Elasticizer, which recently celebrated its 40th birthday. This intensive moisturizing pre-shampoo treatment is magic! It delivers elasticity, bounce and shine to all hair types, even after just one use. We have gone to the gym and played golf with Elasticizer on—just put hair in a bun after you apply the product and be on your way. The heat that your body generates from these activities gives the treatment and extra added punch! Elasticizer can also be used to style hair—this is something we learned through experimentation! It can be applied with a styling cream with some hold to give great frizz-free definition to curls and can be used to achieve that piecey ends look on an edgy bob. Have a kid with curly-ques? A little Elasticizer makes a great leave-in conditioner and detangler. We’ve even been told that some sensitive-skinned men love TO SHAVE WITH IT! Have YOU conducted a successful Elasticizer experiment? Please do tell! We would love to share your tip(s) with the Travel Beauty community.